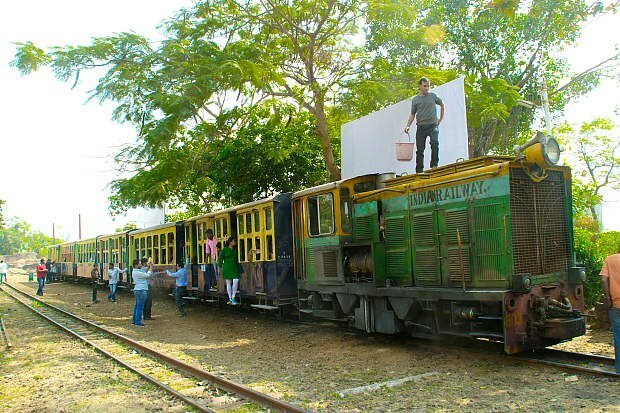 There are five popular tourist trains (Toy trains) in India. All these five tourist trains run on narrow gauge line connecting hill station to a plain area. The prime purpose of these trains is to carry tourists and not for any transportation needs of the local people. Usually these trains take more time than usual road journey so not much used by locals. Demand for these trains goes up during tourist seasons or during holidays. Some of these trains do not have online booking facilities. Some of them are still hauled by steam locomotive which is the main attraction for several tourists. In addition to these five toy trains, there are few more trains which pass through beautiful places but we can�t count them as tourist trains because they are used by all and they just pass though some tourist spots. These trains have featured in many Indian movies. It is very difficult to say which one of these is the best train but all these trains have its own attraction. This train runs between Kalka station in Punjab and Shimla, the capital of Himachal state. The train starts climbing in upward direction immediately from Kalka station and finally reaches Shimla at a height of 2076 meter above sea level. This train passes through 102 tunnels and 87 bridges. The longest tunnel among them is near Barog station. Shivalik Express, the best train in this route starts its journey early in the morning and reaches Shimla around 11 AM . You can enjoy breakfast in the morning inside the train while climbing the hills and passing through the tunnels. The return journey starts afternoon from Shimla. This train is highly recommended for tourists visiting Shimla. Howrah Kalka mail is the connecting train for this toy train. Another train in this line is Himalayan Queen, starts around noon and reaches before evening at Shimla. The famous song Mere Sapno Ki Rani of 1969 classic movie Aradhana featuring Rajesh Khanna and Sharmila Tagore was shot showing this toy train and its track by the side of road. This train passes through Ghum station which is the highest railway station in India at a height of 7407 feet. 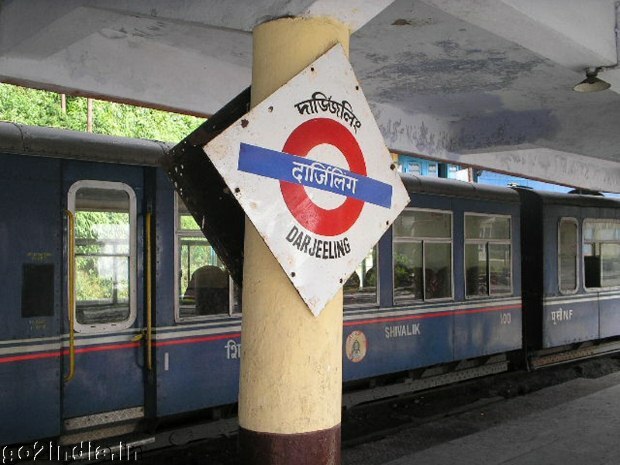 The end station Darjeeling is located at a height of 6812 feet. Steam locomotives are used for the short span Joy ride between Ghum and Darjeeling stations. 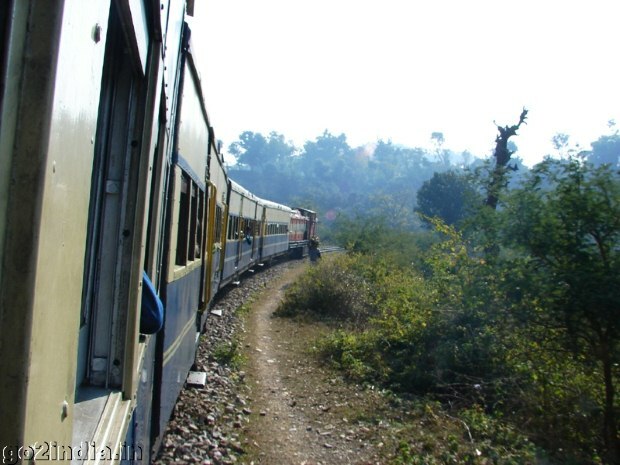 While travelling by road on several occasions you will cross the railway track and the train also. 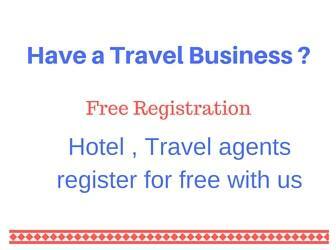 This is the best weekend trip for Mumbai traveller and other tourists. This service is not available during rainy seasons. It connects Neral station ( local station between Mumbai and Pune ) to Matheran hill station at a height of 803 meter. Frequency of trains increase during weekends. Udagamandalam is popularly known as Ooty and this train is also known as Ooty toy train. 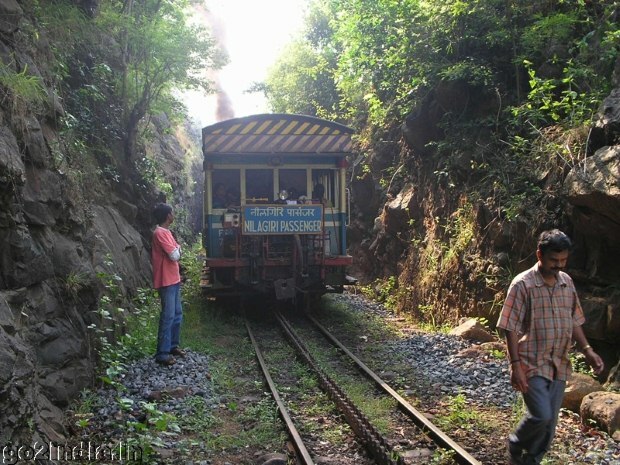 With 16 tunnels and 250 bridges this train passes through Coonoor town famous for tea gardens. From starting station Mettupalayam to Coonoor a steam engine pushes the train from the back. The first class compartment is connected at the front side of the train giving a spectacular view of the track and valley ahead. This train passes via Kangra valley through high bridges and tunnels. It takes more time to reach Joginder Nagar than the usual road journey. Towards end of the journey you can see snow capped mountains and rivers flowing by the side of the train track. The journey became more enjoyable after Kangra station. Take a first class ticket from the counter ( no online booking ) at Pathankot and travel to opposite side of the platform one. 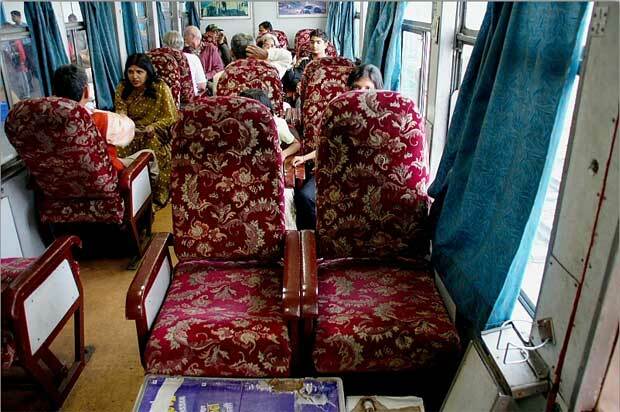 There will be one first class compartment in this train and you can spot it easily. Take a right side seat to enjoy the valleys and rivers flowing by the side of the track.